The Voice prides itself on being a reality competition show devoted to discovering new talent, but it’s most noteworthy star to date has to be pop diva Christina Aguilera. This blonde bombshell took off Season 4 from the show to regroup and recharge, but now the superstar is back and looking better than ever. Wetpaint Entertainment caught up with Xtina and the rest of the coaches at the NBC summer press junket where the “Beautiful” singer was looking more trim than ever. And when she was asked about her drastic weight loss, she had a surprising secret to share. The typically private star even alluded to her painful divorce from Jordan Bratman, the father of her son, Max. She started The Voice less than a year after filing for divorce, ending an eight-year marriage. The diva admits that part of her reason for leaving the show was to rejuvenate a temporarily dull career. Xtina thinks that her time away will allow her to be a better coach and mentor to her contestants in Season 5. “I'm spreading the love,” Christina continued. “I think the boys feel it. I came back. I'm like, ‘I just want to laugh with you guys and have fun.'" Are you excited for Christina’s return to The Voice stage? Tell us below! 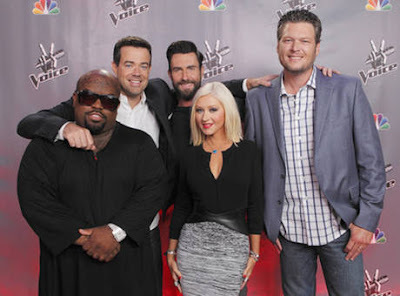 The Voice Season 5 premieres Monday, Sept. 23 at 8 p.m. ET on NBC.